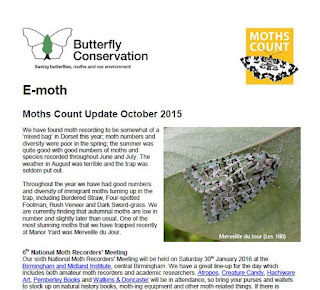 The latest "Emoth" newsletter is available from the National Moth Recording Scheme, via Zoe Randle at Butterfly Conservation. "Here is the latest edition of E-moth, it contains the usual update on the National Moth Recording Scheme, the programme for the National Moth Recorders’ Meeting on Saturday 30th January 2016, feedback about Moth Night 2015 and some other interesting snippets. Please feel free to pass E-moth onto others or include parts of it in your own newsletters, websites etc."